Welcome to the world of Luxaflex®. Your guide to choosing the window coverings that suit your own personal lifestyle. Depending on your individual preferences, you can use different designs to adjust and control the light, create a variety of moods, influence the atmosphere or add character to every room of your home. Which ever look you select, you can be confident that the luxaflex® brand is your guarantee of excellent quality, innovation and years of enjoyment. Combining superlative design with timeless style, the Luxaflex® Interior Shutter collection exudes Quality and Elegance and has been designed to suit any interior style from vintage chic to modern minimalism. Step 2: Which Louvre Size? The size of the Louvre or Slat is an important decision! The Louvre size will transform the way you use the room. The common decision for fittings is to NOT have the handles and colour, coordinate the hinges. The Frame styles are normally decided upon once the measurements have been taken. For Example: If you want to fit the shutters inside the window reveal or recess and the diagonal measurements have 15mm difference then you would choose a Z frame. For Example: If you want to fit the shutters outside the window reveal or recess and want the frame flush with the wall then you would use the L Frame with Dual inserts. For Example: For large windows the T Post may have to be used, to add strength to the structure. Step 4: Which Installation style? 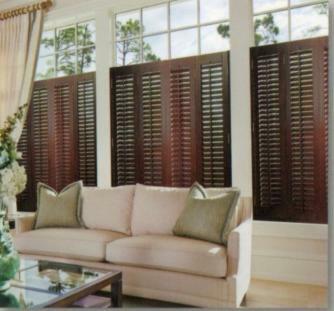 How do you want to use the shutters? To give yourself privacy but allow in, natural Light? Or as a normal window covering? Over these drops the shutters are supplied with an intermediate rail, as shown. This rail provides added stability to the structure and gives better light control as there are two sets of independently controlled louvres. Perfect for overlooked windows, to give privacy and allows natural light to enter the room. Solid Panels are available for enhanced privacy. Top Tracks are ideal for large areas. Do you want a shutter for an unusually shaped window? Almost any shape can be made, from arches to circular and even hexagonal. You can transform those awkward windows that you have always had trouble with covering. This the best part of the decision making process! 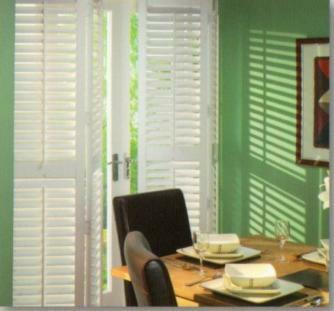 Please note: PC Screens have different resolutions so some colours will look different to the actual true colour and Luxaflex Shutters are made from Real wood and not MDF or equivalent, so the shutters supplied may vary from the samples shown. The samples shown are an example of the tone and grain variation of Oak & Cedar real wood. Please do not choose exact colours when using real wood as dissapointment will not be refunded. The whole point of real wood is the beauty of the variations. For the perfect colour coordination we are able to colour match to the most popular paint colour references.